For years, I felt behind the ball with our savings. Regrettably, I stuck by several beliefs that contributed to accumulating a negative net-worth well into our forties. One of them was that we should not save while we still had debt (which is sound advice in most instances – with some exceptions – and we fell into one of those exceptions). The other was that we could not “afford” to save. We were living paycheck to paycheck and just couldn’t see how we could make saving work. Ultimately we turned those beliefs on their head and instead of believing we couldn’t do it – we worked really hard to figure out how we could. Ultimately, we discovered there are only three ways to do it, 1. reduce/eliminate fixed expenses, 2. reduce discretionary spending, or 3. increase income. 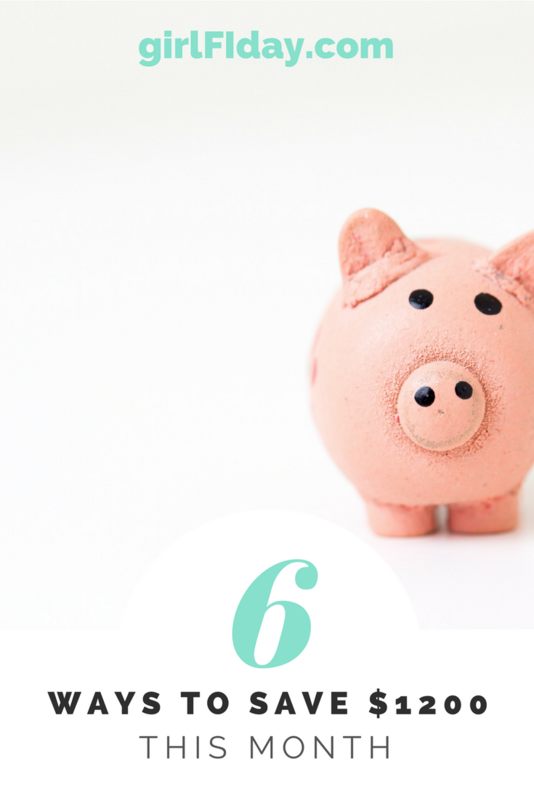 Today we are going to look at six simple ways we reduced or eliminated some of our fixed expenses. In total, this put $1200.00 back into our budget and increased our annual savings total by $14,000.00. We did it. We cut cable. Well, what we really did was kept the Internet and only the local stations. But, just this switch saved us about $120.00 a month. We purchased a couple used Amazon Fire-sticks on Offer-up and then we subscribed to a couple of services like Hulu and Netflix; we already had Amazon Prime. With the three of these together, we have not missed cable one bit. We have actually expanded our options and have watched some really great programs we might not have watched otherwise. Hubbs still is able to watch most of the sports he wants through a combination of local channels and streaming apps on his devices. Hubbs is happy – so is Momma. A couple of years ago, I felt extremely guilty about all the plastic water bottles we were using in our household. With a family of 8 and multiple athletes, we were going through bottles like crazy AND spending a small fortune! So, in an effort to curb my guilt, I signed up for bottled water service. The rental of the cooler was insignificant, but the jugs and the delivery was starting to total over $100.00 a month. So, I found a cooler on Offer-Up for $50.00. We bought a couple of jugs and fill them up on the weekends for about $1.25 each. HUGE savings. And the water is cold and tastes no different in our re-usable shaker bottles. Not gonna lie….this one still hurts. It hurt extra this morning when I was scrubbing dirty hand-prints and grease off of my white cabinets and fingerprints off of all the stainless-steel appliances. Do these people not see there is perfectly good hand-soap and paper towels on the counter right there beside the sink? And when a fur-ball the size of an armadillo scurries across the floor, I have to stop myself from speed-dialing our former housekeeper. Then I remember what we are trying to achieve and this was an expense that was costing us about $400.00 a month. That is some serious cash. Our housekeeper was amazing and there is just something about coming home to a fresh and clean home…She always seems to do a better job than we do. Instead, we all pitch in as a family, even the Littles (they have gotten really good at cleaning the baseboards), no one gets a red-shirt on Team Mays. It doesn’t take all that long and we still get the fresh smell of Fabuloso afterwards. Maybe when we hit a positive net worth I will consider adding this one back in, out of all of them, this one pains me. Because we are stuck in a contract, we have not been able to seriously cut our cell phone bill, but we have been able to cut it by $45.00. $25.00 of it was by taking off services we were not using. The other $20.00 was by paying off one of the devices. We have a few more devices we are going to attack one at a time and once the contract is up, we will consider switching providers, though we are a bit wary about this. I travel for business through the desert between Arizona and California and with another provider that promised service as good as Verizon – it was simply not true. I lost service as soon as I left the city. We will cross that bridge when we get to it. If you do not have special considerations like we do, there are a ton of really great options out there that will save you a lot of money. If you use the gym regularly, I won’t be mad at ya’ if you keep this one. But if you are not – then just cancel it! If you are ready to commit to a healthier life style, there are plenty of ways you can do this for free (or close to it). Walking, running, hiking, biking…Be creative – get outside. This one saved us about $150.00 a month….twice. But..but…but…my kids NEED to be in gymnastics, t-ball, soccer, piano-lesson and karate….NO. No, they don’t. I know this is probably going to be an unpopular one, but you need to hear it. ALL of us parents need to hear it. We are over-involving our kids anyway. This last generation of kids is SUPER-STRESSED out and it’s because of US! Chances are your kid is NOT going to be the next NBA or NFL star. So why are they competing to the extent that they are? Do sports and other extra-curriculars help with scholarships? Yes. Am I saying sports are not good for kids? No. We are a family of athletes. Sports and other extra-curriculars offer so much more than that. We love sports! What I am saying is that your kids don’t need to be involved in EVERYTHING. They also don’t need to be in competitive soccer at age 5. Put these things on hold until you have your spending and savings under control and you have money in the bank. Here is the truth – If you are living paycheck to paycheck – these are expenses you cannot afford. Instead, if you must, put them in a recreation league…it will save you thousands in a year. We cut Karate – and saved $375.00 a month. Instead we put one boy in basketball and another in tumbling at a local church’s rec league. It was cheap and the boys are, most of all, having fun while learning the foundations. Can you make the same cuts? Are there others? Take a look at your bank account, what fixed monthly expenses do you have that you can either reduce or eliminate entirely…. With these six easy cuts, we are saving almost $1200.00 a month!!! WOW. That’s a big number and each expense alone was not killing us. But a cut here…and another there…it adds up. $1200 a month is $14,000 a year. NO KIDDING! How would It make you feel to have $14,400 growing in an investment account – every year? If you think you can’t afford to save, take me up on a challenge. Go through every expense you have on a monthly basis and ask both, can I reduce this expense or can I cut it and see how much you can save? Prove me wrong. I can definitely relate to the extra curricular stuff! For years we’ve just been going with the flow ‘because it will be good for the kids’. We recently decided to do an annual review of the kids extracurricular activities, just as we would for phone, electricity, other recurring costs. An annual review is a really great idea! We can have such guilt about not doing “enough” for our kids that we can lose site of the bigger picture. Love this so much. My husband and I are working hard by living on less. Less everything. And we should be able to retire to Mexico in just a few years! 2 years min from now – 5 years max. So we realized how much we have spent over the last year and decided this year we would cut it back a bit more. We truly want to be around for our kids and grandkids, so eating more at home and not out as often is a win win on both the health and cost front. Being more strategic with our spending has given us the ability to still spoil our grandkids, save some money and even take some well needed time away as well. Thanks for sharing. It was much harder to save and stay on track when we still had kids at home. You are offering something so great to one another and to your kids. Goals can be achieved. So set them!!! Blessings to your amazing family! Come see us in a couple of years at sea of Cortez! Thank you! Bravo on the hard work and being so close to your DREAM. I would love to catch up to you on the Sea of Cortez! Great post! I opt for the $10 Planet Fitness membership – keeps me in shape in the winter weather but also doesn’t break the bank. I think the extra curricular activities are key! These are great tips to cut expenses out of your budget. I can’t believe how many people live paycheck to paycheck but indulge in all of these unnecessary expenses.